Ananya Panday is a few months away from her Bollywood debut - Student Of The Year 2 releases in November this year - and has wrapped the first schedule of the film's shoot. Before she begins with round two, she's spotted chilling with her family in New York. 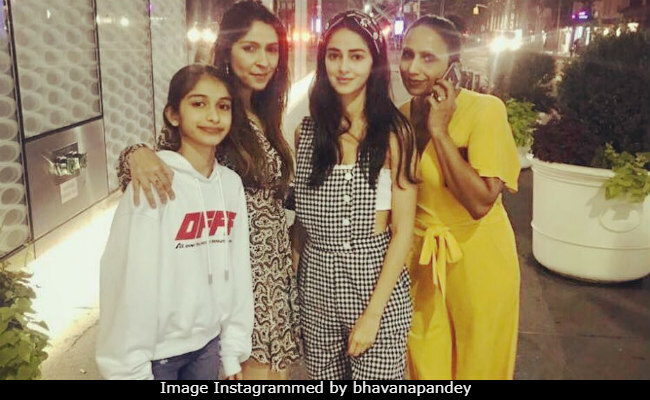 Both Ananya and her mother Bhavana Panday are filling up their Instagram feeds with frame-worthy photos from the Big Apple, all of which we have curated here. You're welcome. We recently spotted Ananya on a family photo shared by Bhavana - "With my most favourite girls," she wrote. Ananya Panday, all of 19, is cute as a button in a monochrome overall, which she paired with a headband. We're taking major cues from her vacation wardrobe - so simple and fresh! Ananya also recently shared a tongue-twister on Instagram along with a selfie of hers and let's see what she said. Here's Ananya Panday's guide to keep calm when life gives you lemons. Ananya Panday's Student Of The Year 2 is being directed by Punit Malhotra and will be produced by Karan Johar's Dharma Productions. Ananya's first Bollywood co-stars are Tiger Shroff and model-actress Tara Sutaria, who is also marking her debut in films. Student Of The Year 2 releases in November this year.